The benefits of providing an onsite corporate fitness center at the workplace are far-reaching and they may or may not have anything to do with reducing health care costs. For leadership, it’s easy to focus on this tangible measurement and lose sight of other reasons to support employees in their health and fitness goals. Learn how one member at a NIFS client location has found value in using her corporate fitness center as she strives to maintain a newly established healthy lifestyle. Was there an “a-ha” moment or life event that led you to make a positive change for your health? I’ve known for a number of years that I needed to improve my health, but always had excuses for not doing so. When my granddaughter was born in 2016, I knew I wanted to be around to see her grow up. I also wanted to be able to keep up with her energy so I could be active in her life as she got older. She, and the future grandchildren, have been my inspiration. What has been a key factor in helping you stick to your new routine? What is your motivation? Staying motivated is a challenge, so I set a number of small, fun SMART goals that I was determined to achieve. For example, when work sponsored a team to run the Indianapolis Mini Marathon, I decided to run the 5K race. Our NIFS fitness center staff provided a training program to follow. I finished in the top 10% of my age group. I have signed up for five more races, with the next goal being to win my age group. 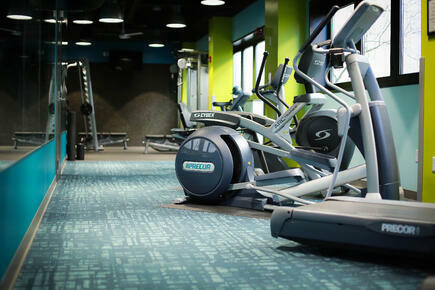 How has the fitness center provided a supportive environment for you to work on your health? There are a number of benefits of having the fitness center onsite. First, it is convenient. Employees can go before work, at lunchtime, or after work; that flexibility is a huge help. I also like the personal attention that is available to help build a structured exercise program that will achieve specific goals. In our corporate fitness center there's a huge variety of activities available, especially the group fitness classes. You can try something new each week. I really enjoy the supportive atmosphere of the coaches and my coworkers in the center. They make exercise fun. I also feel that we're lucky to have the center as one of our corporate health benefits. The fact that our leadership supports the existence of the center signals that employee health and fitness is important to our organization. What would you tell your coworkers who still haven't tapped into the benefits of the corporate fitness center? I spent a long time feeling like I was too tired to put exercise into my schedule. I also told myself that I just did not have the time. But, now that I am exercising regularly and feeling better, I have more energy. I also am more agile and can do things around the house that I have not been able to do in years. It’s funny that one of my excuses in the past for not exercising was thinking I did not have the time or was too busy. Now that I am exercising and have more energy, I get things done faster. So by exercising, I have more time. 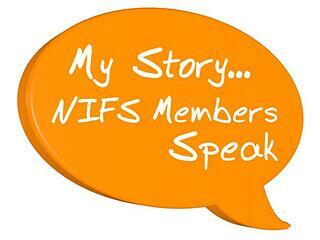 To read other NIFS "members speak" stories, click here. If your'e looking for a corporate fitness vendor to start improving your employees lives, click here to find out how we support our clients across the US. In a seasoned corporate fitness program, sometimes it's hard to figure out where to look next for improvement in the services, staffing, or overall offering. In NIFS almost three decades of providing corporate fitness management services, we've continued to evolve our use of surveys well beyond the typical satisfaction ratings. Below are three tested survey styles that we use on a regular basis to improve our corporate fitness centers and ensure our staff are doing everything they can to sustain a positive and inviting fitness atmosphere for employees. We know that creating a positive and welcoming first experience for employees in corporate fitness is crucial to winning loyal members. And we value customer service skills in our staff as much as we value sound exercise science knowledge. In order to capture our staff's effectiveness at using strong customer-focused skills with new members, we began implementing a new member experience survey. We use the tool in a monthly welcome email with new members to get a better picture of any potential barriers members may experience as well as to better understand how well our staff are implementing expected procedures for orienting new members. Results from this survey offer strong talking points in semi-annual review discussions or more frequently if needed to both praise and correct staff, based on member feedback. When we contract with a business to provide fitness center management services, part of the package includes managing liability within the fitness environment. We have several components in our quality assurance program that support this activity, including a monthly emergency procedures survey which our managers fill out. It provides a nudge to ensure they're checking emergency equipment, stocking first aid kits, and documenting any missing or broken supplies in a timely fashion. We also have an annual risk management survey and a semi-annual emergency survey where staff work through emergency scenarios and take an emergency preparedness quiz. I suspect that most vendors like us provide a satisfaction survey to share with clients how the staff, services, and spaces are being received by their employees. It's foundational to measuring our commitment to the client; in fact, portions of our satisfaction survey sometimes translate into service level agreements between us and the client. We've made tweaks to our standard survey over the years, and we recently added a Net Promoter Score question as a new twist that provides us with more of an industry benchmark for the way our staff are connecting with members to build loyalty. Detractors, rate their likelihood to recommend between a 0-6. They are considered likely to stop using your product/service and/or share negative feedback about your product/service. Passives, rate their experience as a 7-8. They’re neutral to your brand; they might continue to use your product/service, but they aren’t likely to invite others into the fold. Promoters, rate their experience as a 9-10 and they are considered evangelists for whatever you’re selling; they LOVE you and will tell others about how great you are. 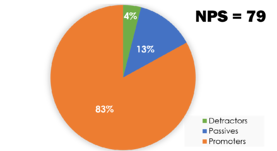 The industry average NPS for fitness centers as tracked by the International Health, Racquet and Sportsclub association (IHRSA) is 43. That score includes commercial gyms, so it’s not quite apples to apples, but we are talking about a very similar scope of services where members are entrusting their physical health to the fitness center staff and carving out their very precious personal time to spend time at the gym. Since we added an NPS question to our survey over the last few years, we have far exceeded that industry benchmark and we are regularly looking at strategies to continue growing member loyalty. This overview provides a good snapshot of the types of information we gather through surveys, but I haven't touched on how we use the survey responses to coach our staff, improve our client relationships and manage customer liability. To dig more deeply into these topics, grab our white paper. Should We Still Use BMI and Body Composition in Corporate Fitness? For years, fitness professionals have been trained to use Body Mass Index (BMI) as a prescreening tool when individuals join a fitness program. It was part of the recommendations by the American College of Sports Medicine (ACSM) for evaluating health risks; tobacco use, cholesterol profile, and family history for cardiovascular disease were also part of that process. In 2015, the ACSM updated their guidelines, and guess what? No BMI screening was included. Why Is BMI No Longer a Screening Tool? The changes to the ACSM guidelines were positioned largely around decreasing barriers for individuals to start an exercise program. After years of research, what they found was that BMI was not a driver of cardiovascular events during exercise. Anecdotally, I can say from experience that I had a lot of (sometimes angry) individuals wanting to join the corporate fitness center who needed a medical release because their BMI was "too high" and they had one other risk factor, such as not knowing their cholesterol or current tobacco use. So for our staff and their members in corporate fitness environments across the country, I thought this was a positive change. But it leaves me wondering if we should be looking at BMI at all. There's a lot of back and forth in the wellness community about the "value" of BMI. The screening tool was always meant to be a field test to determine appropriateness of weight for a given height. And truly, it's an easy measure to determine; there are BMI calculators all over the internet. But that may be the end of its utility as a screening tool. There are a lot of questions about how meaningful the information really is to either the individual being assessed or the practitioner with whom they're working. 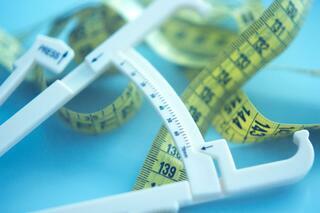 If We Don't Use BMI, What Should We Use? This is something of a loaded question and points to our cultural obsession with "healthy" body weight. Do we need to screen for fatness? What's the value in those figures? Certainly measuring percent body fat or circumference might provide more meaningful ways to track an individual's desire to lose weight. But there are caveats on providing that information, too. Our staff members are providing those measures as field tests in our clients' corporate fitness centers, and the accuracy can be questionable, particularly for body fat assessed by skinfold testing. We have a responsibility in our clients' fitness center environments to help the members live well in the ways that are meaningful to each individual. That might mean helping someone work on gradual, healthy weight loss. It might also mean working with someone to help them learn to appreciate the difference between feeling good when they move their body and feeling bad when they step on the scale. The goal for our staff is to help the members they serve improve their health in all the ways that are articulated. When tools like BMI are so limiting (and potentially harmful to the psyche), we have to take a hard look at whether those tools are helping us achieve that goal. With so many other fantastic programs in our books to help people move more, try new areas of healthy living, and even remember what it felt like to play at recess, I think we have just what we need to create positive, successful, healthy environments for our corporate and senior living clients. Check out our creative and effective programming to help keep your members active.